A merry prankster with a taste for herbal delights managed to sneak a picture of something that looks an awful lot like herb onto the Home Depot website. When used the correct way advertising can be very effective. This may have been why a stoner with a sense of humor found a way to get a weed joke onto the Home Depot website. No, seriously, this did happen. 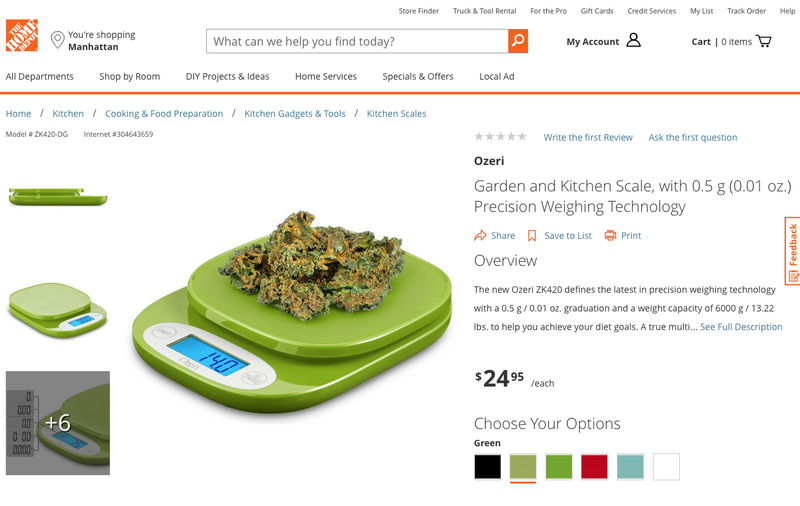 For a short time this past Friday on the Home Depot site under the listing for scales, there was a picture of the standard digital scale with what looked very much like fresh nugs piled on top of it. Unfortunately, the page has been taken down. It was first noticed by Clickhole writer Ben Kling who posted about it on Twitter, asking if anyone knew what kind of food was sitting on top of the scale. The ganja goof was not immediately visible; you could only see it when you clicked on the product’s green option. Oh it gets better. The model number for the scale is the Ozeri ZK420, which is just so perfect, if you ask me. The comments on the tweet are great too. “I wonder if the ZK69 personal massager is next,” quips Kling. One user who claimed to handle a lot of cannabis, said that the food in the picture was obviously kale chips. As someone who eats a lot of kale chips and handles a lot of cannabis, I can see what they’re getting at. So perhaps the substance in the picture is not actually weed, but it really looks like it, you have to admit! This really does look like fresh herb doesn’t it? Tell us your thoughts below!